Remembering the legendary singer during Breast Cancer Awareness Month. I was a little kid in 1975, when I was first introduced to Minnie Riperton via her hit “Loving You” and its major presence on the AM pop-radio stations. I didn’t know that the singer had grown up in a large family on the south side of Chicago or that she had sung backup for the likes of Etta James and Chuck Berry before beginning her own solo career. I didn’t know that her first album, 1970’s “Come to My Garden,” though only a modest hit commercially, would be heralded as a visionary classic in years to come. I didn’t know that Stevie Wonder was as big a fan of hers as she was of his, which led to his co-producing her 1974 album, “Perfect Angel,” from which “Loving You” came. What I did know, as I listened intently and avidly to the car radio while running errands with my mom, was that “Loving You” was one of the most beautiful songs I’d ever heard, and Riperton’s one of the most gorgeous voices. And so, in the passenger seat of my family’s station wagon, I became a lifelong Minnie Riperton devotee. Some of the lyrics of “Loving You” imply that it’s a romantic love song. And maybe it is, in part. But to my young ears, it sounded like something else. I felt that this lovely voice was singing a lullaby — and I was not surprised at all to discover years later that Riperton sings “Maya, Maya, Maya” at the song’s end, for her daughter, the actress Maya Rudolph, who was a toddler at the time. I do remember hearing about Riperton’s breast cancer diagnosis, in 1976; and I remember seeing her speak about it on TV. It wasn’t a topic anyone heard much about in public then. 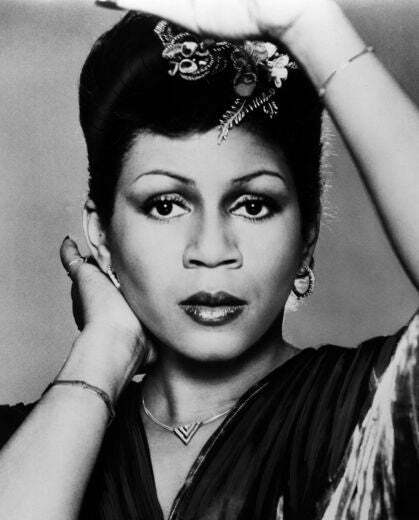 Indeed, Minnie Riperton was one of the first public figures who decided to speak more openly about facing the disease. Her calm, grounded candor did so much to take the fearful secrecy out of breast cancer, and cancer in general, at that time — and so, most appropriately, President Carter honored her with a “Courage Award” from the American Cancer Society in 1978. Cancer aside, Riperton was a woman not easily thrown by anything. In 1975, she recounted to Sammy Davis Jr. on “Sammy and Company” the experience of having been a bit too enthusiastically greeted by a lion during a commercial shoot for her album of that year, Adventure in Paradise. “It did freak me out,” she admits on the show, but the accompanying film clip of the lion-pounce moment shows her handling it more unflappably than just about anyone else would. “She’s so sweet, the lion wouldn’t eat her,” says Richard Pryor, who was also on Sammy’s show that day. If only courage, candor, sweetness, or overall belovedness could be the cures for cancer. But I remember tears in my eyes in July of 1979, when I heard that Minnie Riperton had died. She was only 31. I never stopped loving her or listening to her music. Fast forward almost 30 years, to 2008, when I myself received a breast cancer diagnosis. Sure, I cried, plenty; but somehow, through my shock and my fear, I also felt a kind of spiritual “arrival” at my side. I could swear I sensed women I’ve known and loved who lost their lives to cancer coming to me and lending me their strength — telling me that eventually, I would be okay. I felt my beloved cousin Gale, my mother’s dear friend Petra, and my own dear friend Sharon, all of whom died of breast cancer in their 30s. I felt very strongly the presence of my mother herself, who died of ovarian cancer at age 51, when I was 15. And I felt Minnie Riperton — her remarkable singing and also the amazing public “voice” she gave in her lifetime to all who have faced cancer. I vowed to do everything I could to live a full life during, and for many decades beyond, cancer treatment — for myself and in honor of so many others. Eventually I built around myself a community of co-survivors through the Young Survival Coalition (a national group for young women who are facing a breast cancer diagnosis), and this has been a tremendous help. One of the lines from “Loving You” — really, one of the loveliest lyrics I’ve ever heard — brings tears to my eyes: “Stay with me while we grow old/ And we will live each day in the springtime.” Minnie did not get the chance to grow old, but I will continue to carry her with me all my life; and in some ways despite and in other ways because of the shadows of having had cancer, I do try to hold in my heart every day a feeling of spring.